Asparagus is one of the early vegetables to break though after winter. It is great fresh but can be canned with good results and doing it at home beats anything store bought! It’s fantastic if you have a nice patch to pick your own, if not, your local farmers market is your best source. How much: You will need about 25 pounds of asparagus s needed per canner load of 7 quarts; about 16 pounds will do a canner load of 9 pints. What you want: The best results comes from young tender, tight-tipped spears, 4 to 6 inches long. What to do: Wash asparagus well and trim off the tough ends. There’s nothing worse than woody stems on asparagus and finding the spot on the stem where it goes from woody to nice firm stem is generally very easy, use your hands to break it or test from the bottom up with a knife and it sill slice smoothly when you hit the end of the woody stem. Asparagus can be processed either whole or cut into 1 inch segments. Processing can be done using either the Hot pack method or the Raw pack method. To Hot pack— Boil your asparagus in a large pot for 2 or 3 minutes. Then pack the jars to about 1 inch from the top with the hot asparagus using your canning funnel. To Raw pack—Use your canning funnel to fill hot jars with raw asparagus, packing as tightly as possible without crushing, leaving 1-inch headspace. With either method, add 1 teaspoon of salt per quart to the jars, 1/2 teaspoon per pint. Pour boiling water using your canning funnel, leaving 1-inch headspace. Remove air bubbles and adjust headspace if needed. Wipe rims of jars with a dampened clean paper towel. Place lids and rings and adjust lids finger tight and process for selected method. After processing – Use your jar lifter to remove jars and set aside to cool. Let set for 24 hours and then check lids for seal, they should be down. The lids should not move up and down when the center is pressed. 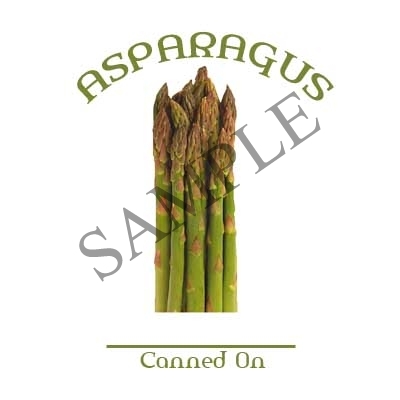 Use any of these great canning labels and Fancy Tops to finish your jar of asparagus.